This year the conch shell sounded at 6:07 AM, 2 hours earlier than last year. I slept very lightly Friday night, especially after midnight, concerned the shell would sound at any time. There were significant periods of heavy rain Friday night that contributed to a light sleep. Most of the time from Midnight on I was concerned the shell had sounded and I did not hear it. I started to get ready about 5:30 AM so my race preparations were well underway when the official 1 hour notice sounded. A couple runners were late getting to the start line. The rain had ended by the time the race started at 7:07 AM. Only a light fog and high humidity remained. For a few hours I put my glasses in my pocket as I could see better without them until the air heated and dried a little. It reached the low 70s with sun during the day Saturday. I made sure from the start to stay with people who had at least done a loop of the Barkley before. By the first book I had settled in with Matt Mahoney and about 3-4 other runners. 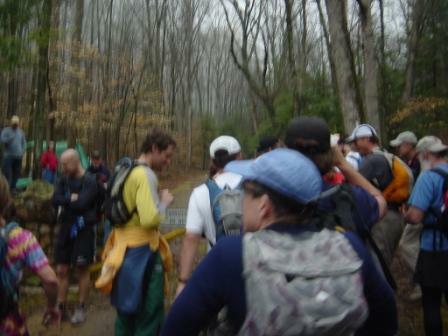 By the 2nd water stop our small group had been reduced to 3. 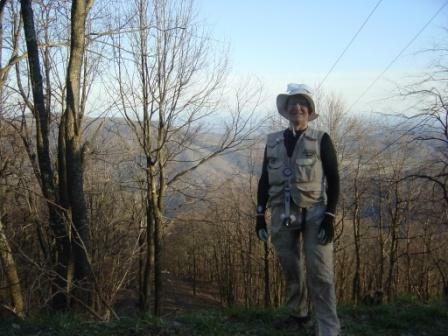 While Matt wore shorts, light shoes, no socks and at many times no shirt, I wore Vasque Trail shoes with gaiters and wool socks, long nylon pants (Royal Robbins), a long sleeved tight (polyester - Spandex) shirt, my favorite white wide brimmed hat and a fisherman's vest. I used most of the pockets in the pants and vest to hold assorted goods, including 4 heavily spread peanut butter and honey sandwiches, a full 1 pound bottle of honey, two 32-ounce bottles of Gatorade, camera, toilet paper, park map with course overlaid in red, detailed written directions for finding the books (9 total this year), compass, water purification tablets, rubber-palmed thin polyester gloves, salt, extra camera battery, head lamps, 2 handheld flashlights, separate bag for safe keeping the book pages, cell phone (no reception though) a plastic rain poncho, sun screen, jacket and balaclava. Had the weather been cooler, I would have brought more clothes along somehow. I heard that one lost runner got to the prison this year and after some interrogation got sent back out there. One runner had his hand wrapped. He thinks he broke it. I ate all 4 sandwiches and had about 1 ounce of honey left when I got back to camp after my one loop. I had finished both bottles of Gatorade and had filled both with stream water and drained them by the first water stop at about 8 miles. In addition to refilling them at that water drop I drank about a quart of additional water before leaving the water stop. Even though Matt had run Barkley 10 times before, we still went the wrong way a few times before the "new" 5 mile section. So while I assumed that Matt would go at a pace with a reasonable chance of getting to start loop two (assuming the body was willing), there was no way I was going to strike out ahead on my own once I sensed we most likely would not make the cutoff, as I was concerned about being "out there" alone after dark with only minimal clothing. A few books we found right away and some took us a bit of searching, even while using the team approach. About 20 minutes was the longest it took 4 of us to find one book on the new section once we got to within 100 yards of it. With appropriate titles like (1st book - "Great Expectations" and last book "If Tomorrow Comes") Gary kept us smiling at each of the book plantings. Other titles included, South of Sanity, Too Deep For Tears, A Flatland Fable, Run For Your Life, God Isn't Done with Me Yet, The Endless Game and All The Days Of Our Lives. 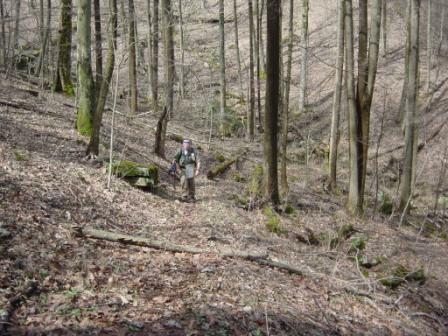 Most races feature well groomed trails. 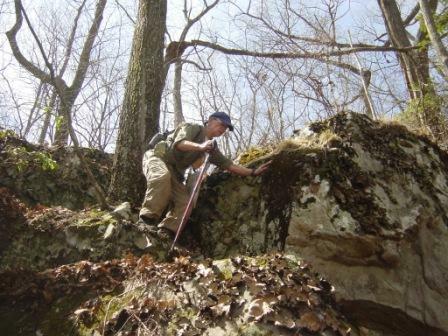 Even the Superior Hiking trail is level, at 90° to the direction of travel. 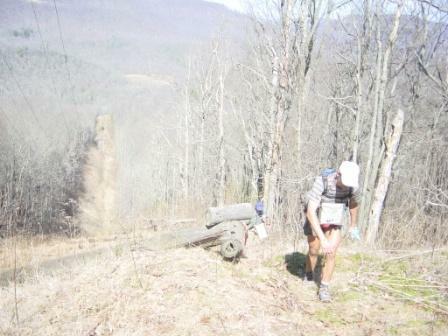 Not so anything but the "CandyAss" trails of the Barkley. 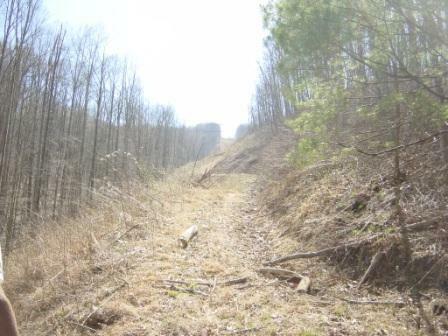 What trails were used, due to their not having been improved for 50 years were worn to the slope of the hill, thus except when bushwhacking straight up or straight down, any switchback unimproved trails were placing one foot higher than the other and causing constant uneven footstrike leading to over use of the side supporting muscles. My quads and hamstrings were fine the whole loop and after the race, but the side muscle groups of my thigh are still a little sore and I developed many hot spots on my feet. Whether the wool socks were wrong or it was just the trail unevenness that caused the hot spots, I don't know. 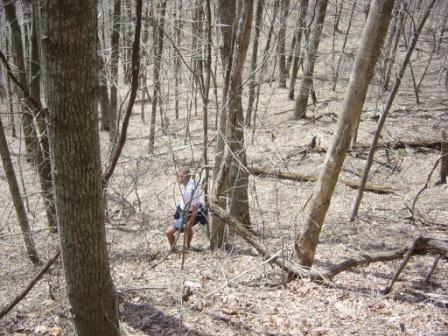 The last couple miles back to camp were CandyAss trails again - down hill (as were the first 1.5 miles of uphill). It was amazing how much easier it was to run again towards the end of the race on the down hill groomed trails. One those easy trails the legs and feet felt fine, when each step was somewhat painful on the last of the bushwhacking just before. 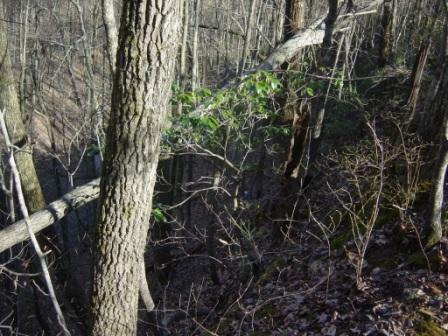 The sawbriers were worse this year as a warmer fall and winter allowed them to grow taller and more dense. Even with my body fully covered, I put the gloves on halfway into the race, I got a few scratches. Many people looked a lot worse. There were beautiful waterfalls, long open views of the interlocking mountains and a varied spring flora, although not much was leafed out yet. A few ginger flowers were open. I took a picture of a lizard on a log and got several pictures of some impressively steep climbs. Its possible Matt will include a few pics of me on his Barkley website update sometime. As we approached camp, Matt asked me if I would be willing to start loop two if we had time and I said sure, as long as he came too! Several runners started loop two only planning to climb to the top of Bird Mountain and sit and enjoy the nighttime view and head back down to camp. Sue Johnston said "This race isn't meant for a woman". And she is a pretty fast, tough runner. I'm still eating the sandwiches I had prepared Friday afternoon for eating during the race. Of course I had to prepare enough to last for 5 loops (everyone does). Gary Cantrel never asks for food. After the first loop he always hs plenty offered to him. I had 18 peanut butter and honey sandwiches in sandwich bags made up and I had 2 more loaves of bread with a large package of sliced turkey and another package of sliced cheese on ice in case I wanted something else besides peanut butter an honey during a loop. I also had several individual sized containers of pasta and soup for eating between loops at camp, as well as a bag of apples and a bunch of bananas and a box of Cheerios and several cans of Ensure. 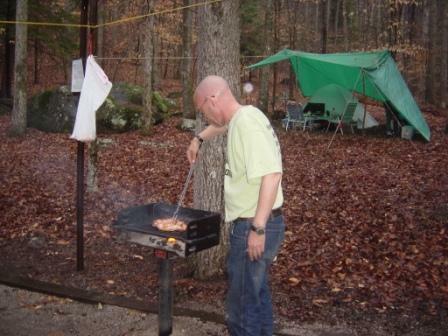 After getting tapped out about 11:00 PM Saturday, Gary and his helpers were still cooking Barkley chicken over a wood fire so I had 2 legs and a thigh and lots of baked beans before dragging my weary body into the back of my truck to sleep. I also put my jacket on and a heavy winter coat as I sat by the fire and I was now (not moving) getting rather cold. Imagine being lost in those woods, alone after dark, especially if its raining, snowing or hailing and you have limited clothing along, being huddled up, trying to stay warm until morning, as some have done. To move aimlessly after dark might get you all the way to Kentucky and to not move risks hypothermia. I waited until morning to shower and examine the damage to my feet, which other than a loose big toenail on one foot looked better than they felt. After my shower just before packing to leave Sunday morning, I went to the start finish line and watched as several runners and helpers were trying to coach Mike Dobies to start his 3rd loop. He just sat in a chair with a very blank look sipping some coffee. Someone asked if he wanted some food and he shouted "HELL NO". Gary suggested he shower and nap a bit to improve his disposition as he still had 2.5 hours to decide whether to start loop 3 or not. I don't know his final decision. The Tee shirt this year said it all. 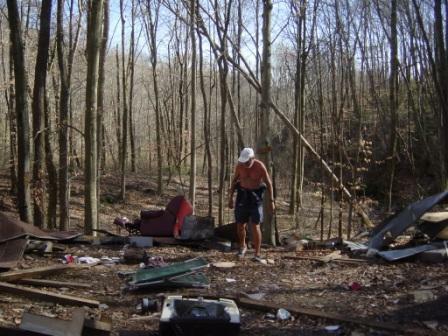 On the front was written "Barkley Marathons". On the back it said "Meaningless suffering without a point". But there really is a point. Where else can you go and be truly challenged by the best that nature has to offer with fellow lovers of the great outdoors and be humiliated and exhilarated all at the same time, knowing how much you left out there and how much you received in return. Things happen at the Barkley. I can understand the fear that can come from being alone in those woods after dark. Matt, Pete and I finished the last of Zipline (a 1600 foot drop in .76 mile) and Big Hell (a 1580 foot climb in .76 mile) in the dark. It was probably good that I could not see to the top of Big Hell, only a few feet in front of my light, as that made the climb less daunting. Will I return next year? Well you need to apply and then you need to be invited. The idiot thinks he will finish the Barkley and the sissy doesn't apply. It would be nice to at least get to start loop 2 once, although while I'm sure I could have run fast enough to have finished a little faster than I did, I don't think I could have finished almost 3 hours faster, which I would have needed to do to have started loop 2. Gary's computer projections had me finishing loop 2, then being confused by the directions, putting my shoes on backwards and then being in too much pain to run. Someone had predicted I would finish five loops. Gary's projections for the guy who spent 32 hours to find 1 book had him being eaten by wolves.....Gary swore that his prerace computer projections would be accurate, and they were amazingly close. 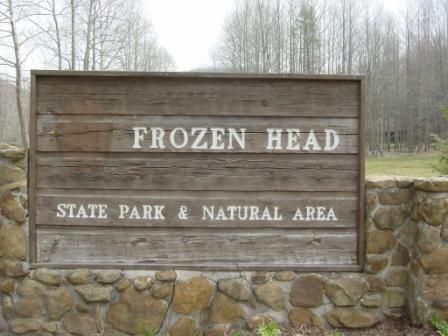 Entrance to Frozen Head and the Barkley Marathons. Race headquarters is a campsite. 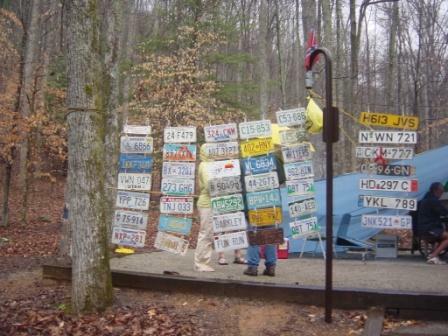 First timers pay an entry fee of $1.60 and a license plate from their home state or country. The license plate sized buckle, awarded in the unlikely case that anyone finishes the 100 mile race within the 60 hour cutoff. (Nobody did this year. In fact, nobody finished the 60 mile fun run within the 40 hour cutoff either). laz cooking the pre-race meal. Q. 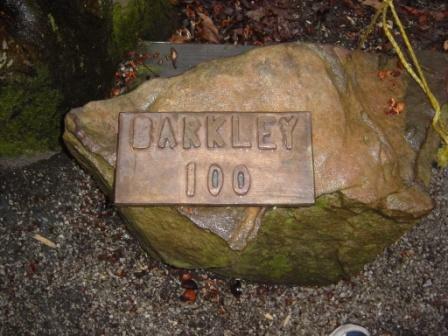 What is the difference between a Barkley chicken and a Barkley runner? A. The chicken is burnt on the outside and raw on the inside. Runners wait for laz to light the starting cigarette. 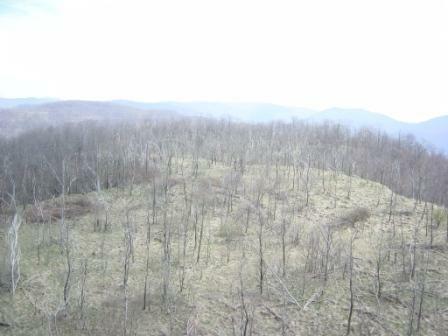 From Stallion Mountain we descend around some cliffs and through a marsh to Fyke's Peak. Matt Mahoney and Peter Ireland descend Fyke's Peak, an 1800 vertical foot bushwack broken up by several rocky ledges. Back up the Testicle Spectacle. The meth lab was a lot easier to find than the books. 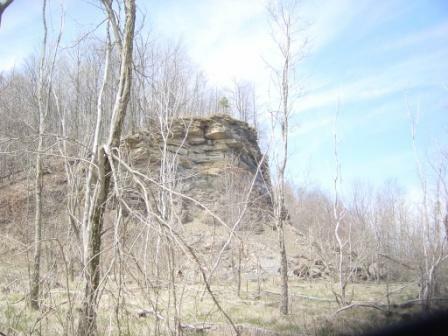 Looking down Methlab Ridge. This is a 60 degree slope. Yes, we had to climb this. Starting up Rat Jaw. At least the thorns aren't too bad here...yet. Peter at the fire tower at the top of Rat Jaw. 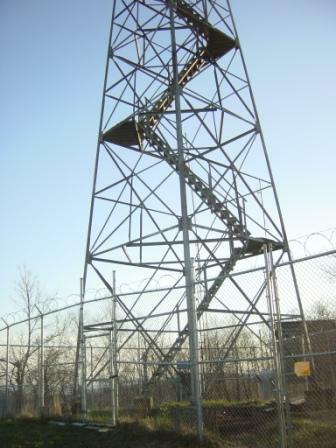 At the fire tower water drop, Milan Milanovich tells how he couldn't find book 5 (near the meth lab), wandered onto the Brushy Mountain prison grounds, where 3 overweight guards searched his pack and escorted him off.